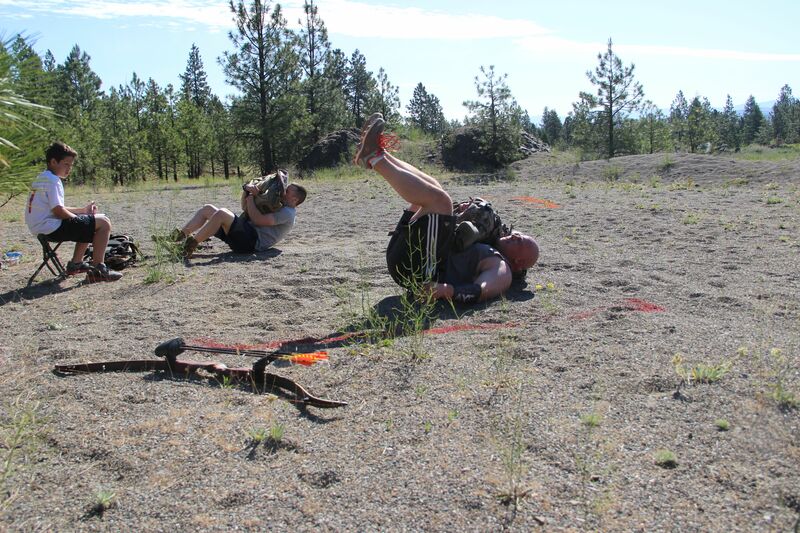 A moment of complete exhaustion, during the last physical trial of the Train To Hunt Challenge: Pack on burpees. Every year I look forward to new adventures and new challenges; but I often find myself living inside my comfort zone. Nothing irks me more than living vicariously through other’s achievements or feeling inspired by what someone else has overcome; only to sit idly by…wistfully. According to Newton’s first law of motion; it’s the natural tendency of objects to resist changes in their state of motion. And when overcoming the inertia of our routine seems too difficult, or impossible; what do we do? We have to mix it up, we have to push forward…and push hard. I started off this year with my heart and mind committed that I would make this season better than the last and in doing so; I would need to mix it up and step outside of my comfort zone a bit. 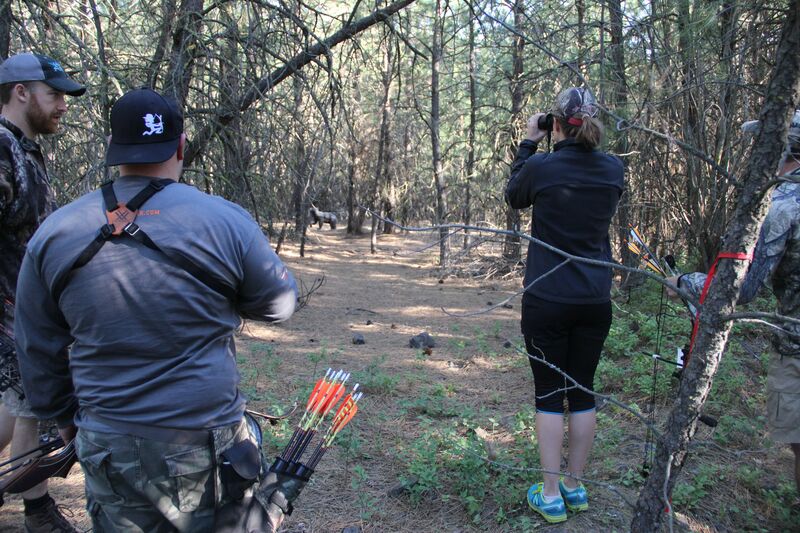 I needed a goal that deviated from the same old “scout more, shoot my more bow more, train more” gibberish that everyone mutters at the start of each year. 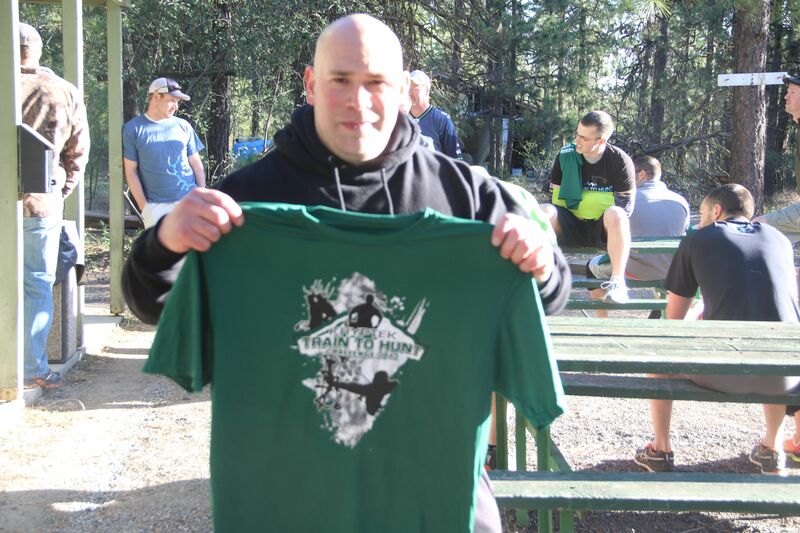 To do this I had to think bigger and commit to something that would be difficult…and why not announce it to everyone, while also reaching out for sponsors, for some added accountability? 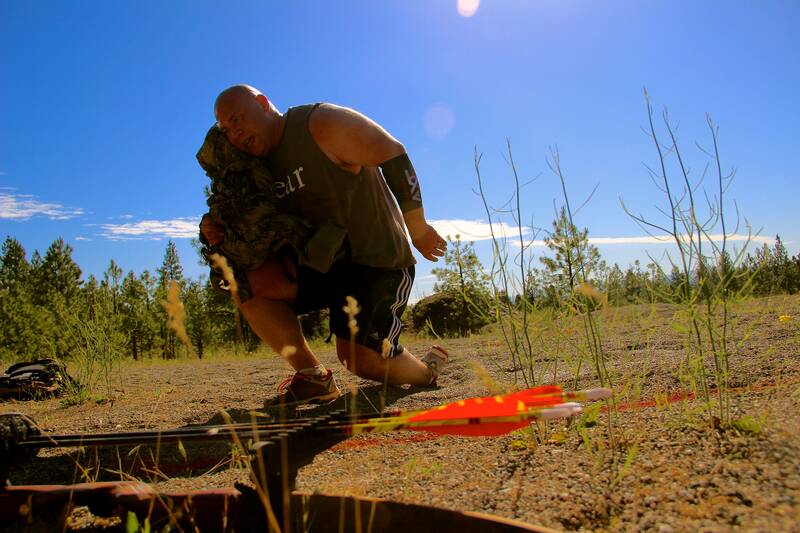 As soon as I heard of this “premier adventure race for bowhunters” called the Train To Hunt Challenge, AKA the”Search For The Fittest Bowhunter In The West”…I immediatly made up my mind that I was in. It was announced late last year and with snow still covering the ground; I went into training mode full-bore. 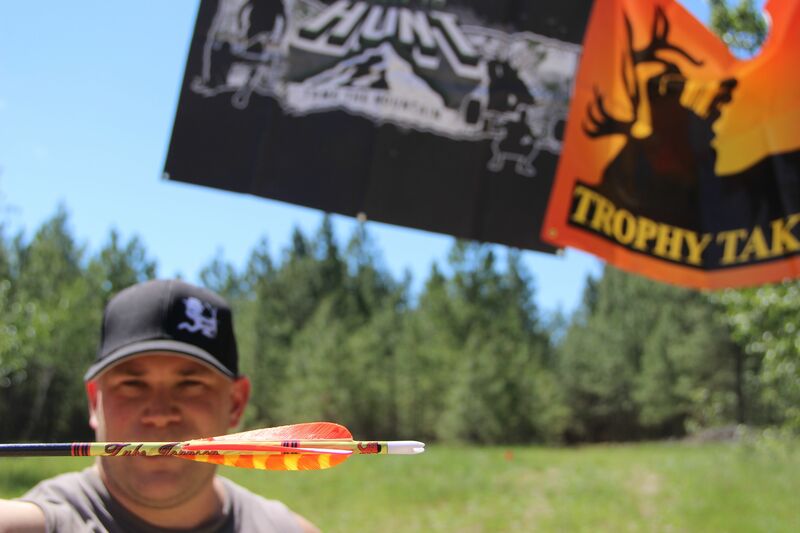 Since I had been hunting more and more with my Recurve and had every intention of starting the season with it in hand…I had to ask myself; why wouldn’t I compete with anything other than what I would be using in the mountains? This would put me at a disadvantage; as far as being competitive goes…but this was more of a competition with myself, more than anything else. The course had been set and no alterations would be made…at least that’s what I thought. One of many training sessions. 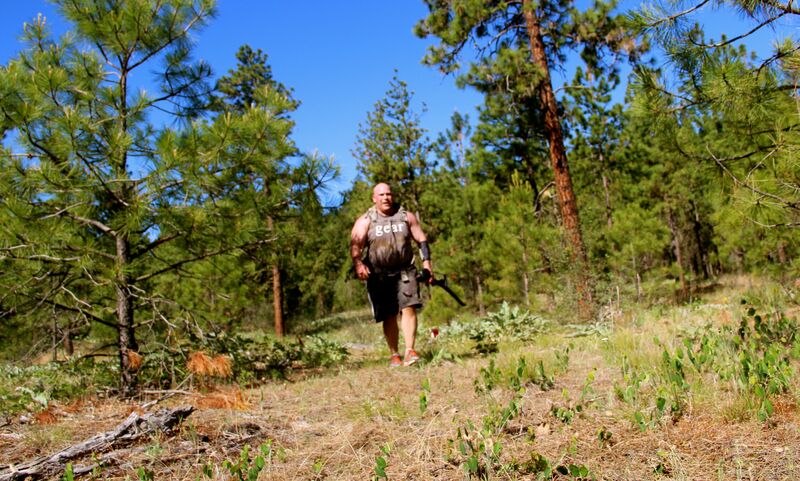 This was just after the snow melted; I trained rain or shine and as many days a week that my schedule would allow. This day it was pouring down rain. 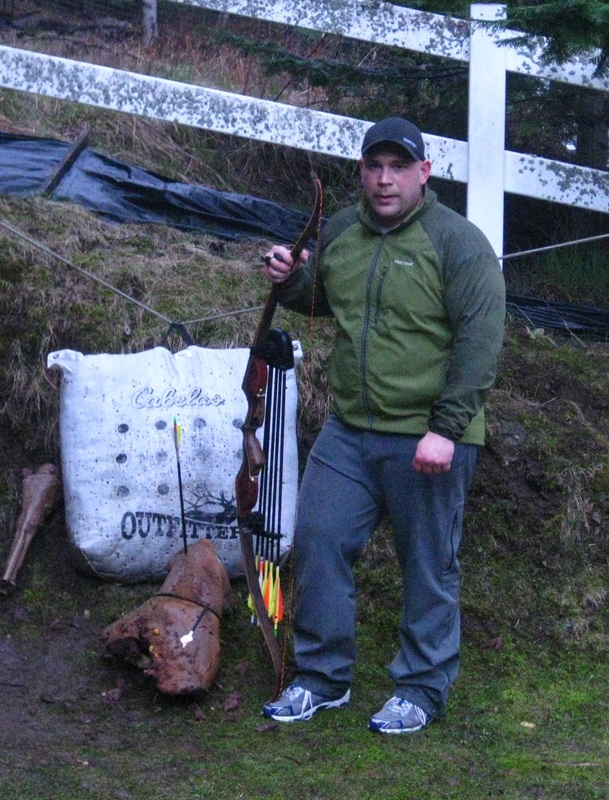 My wife had to snap a pic; thinking that I was crazy as she watched me shoot an arrow, sprint to the target and back to shoot again, all while it rained cats and dogs. You only get out of things what you put into it…and it was my intention to “go big”. 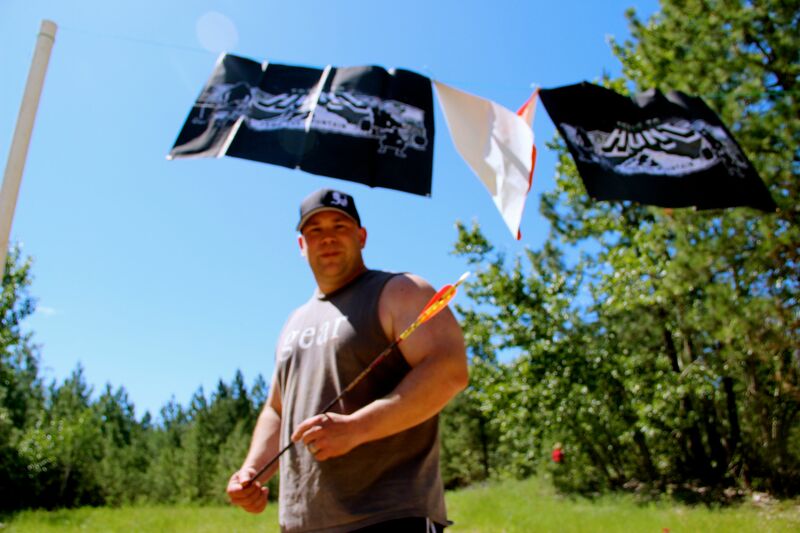 With every workout; I felt my strength and endurance growing and with that, my confidence in my stickbow shooting grew as well. A moment dawned upon me; could I possibly do this? Could I possibly stand a chance of going beyond just competing…when the dust settled, could I actually be standing tall as the victor? At that point is when things went horribly off course. One of the many logs that I had to clear by hand this day. 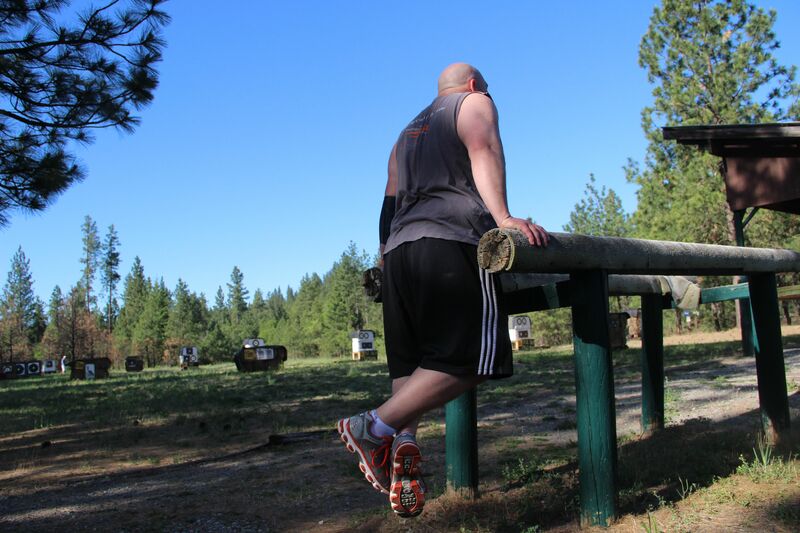 By the time that I got to the log that would end up knocking the “eff” out me; I was pretty exhausted and obviously was not thinking clearly. Hopefully I learned my lesson and will always assume that any downed tree is under tension! The first setback came in the form of a concussion sustained from having an ax handle and my own fist being driven into my face. This happened while clearing a road into an area where my hunting partner had drawn a spring bear tag. I was very fortunate that I walked away with only a concussion, a broken tooth and a slightly mangled right hand. But this would set my training back an entire month and I was almost devastated. 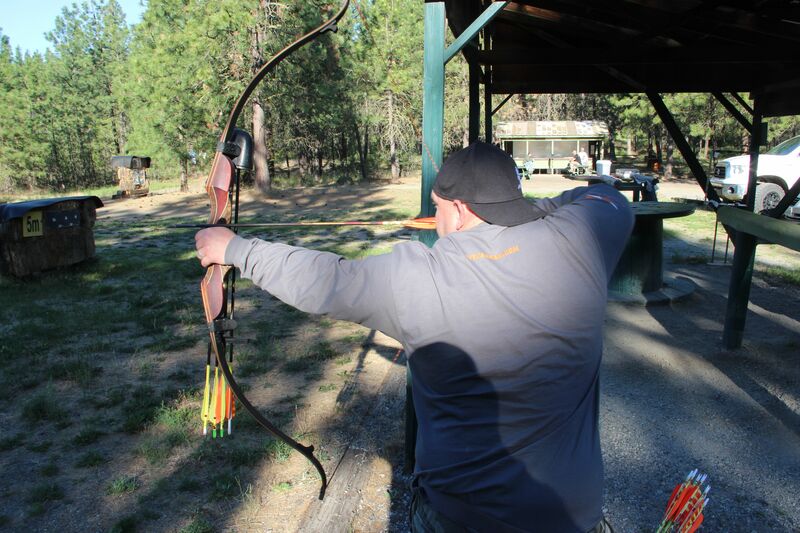 Even though I couldn’t exercise much beyond a short, light walk during the time my brain was healing from my concussion; it was only a couple of weeks before my hand healed enough to allow me to shoot my bow again. 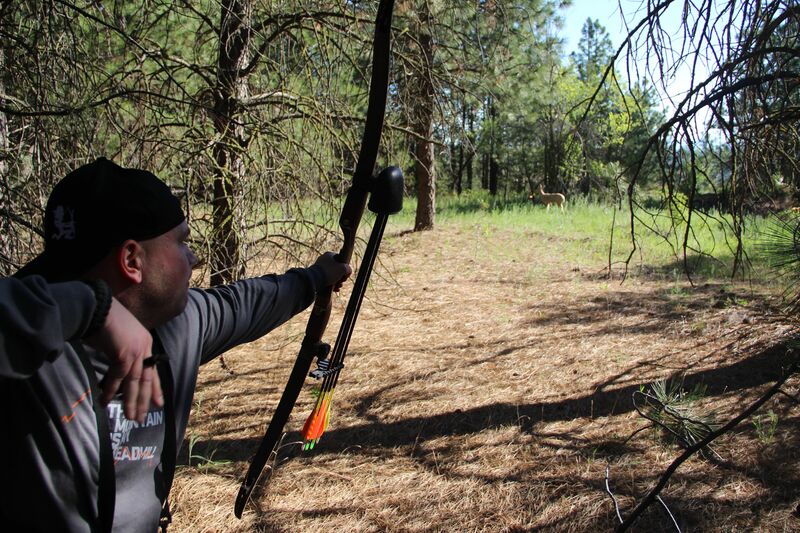 I was ecstatic about this and began to shoot my bow daily from that point on. A view from a rainy day in the spring bear stand. My nephew was to arrow a nice, 300# bear from a different location this afternoon. I had the pleasure of dragging his bear out for him. His expression when he first caught a glimpse of what he had shot; was well worth the effort…even if it was supposed to have been MY bear! Before long I was back into the swing of things and almost to the fitness level as I was before my accident…and then the second set back occurred. After spending a week with my wife on the island of Kauai; I returned and promptly tore my hamstring…only three weeks before the competition. 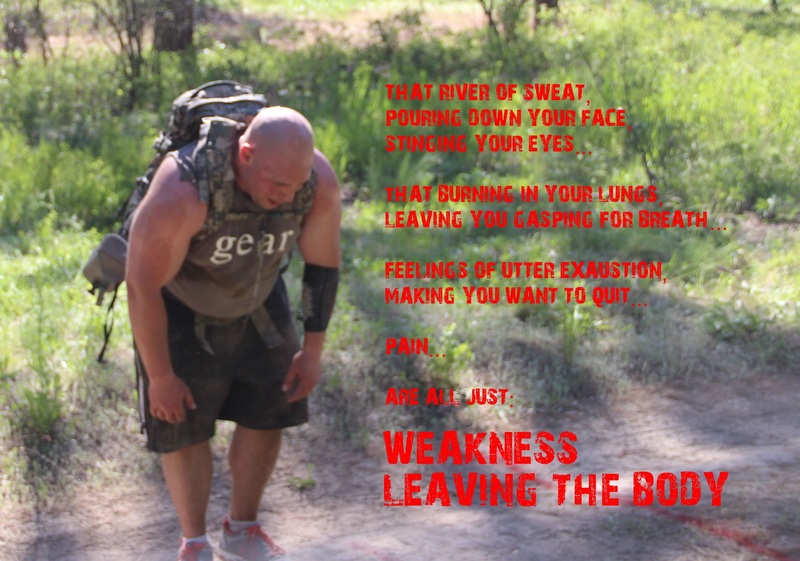 It almost seemed that I just wasn’t supposed to reach my goals this year and that I just wasn’t supposed to be competing in any “bowhunter specific adventure race”. I wanted to scream out loud my frustration; but still was determined to be at the competition and do what I could. A week later found me in a treestand and waiting on a bear that never showed it’s self; but I had the privilege of packing out my Nephew’s first Black Bear instead. 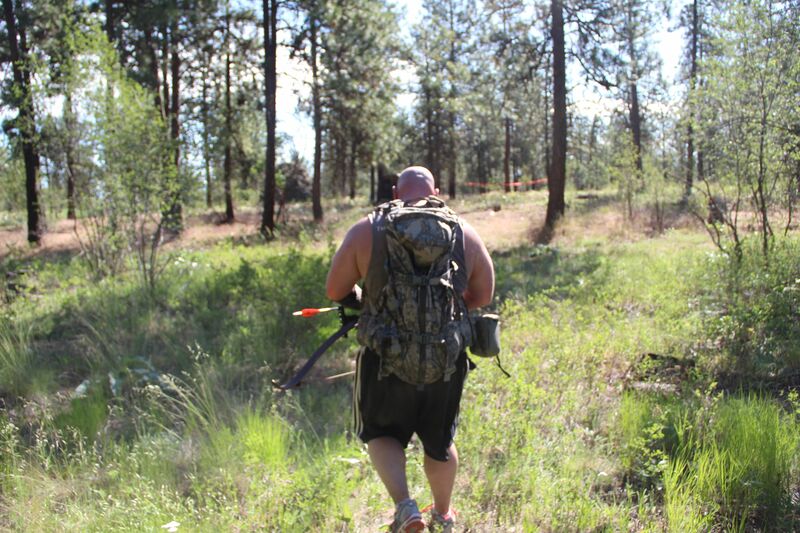 Somehow my hamstring kept it’s self together, as I lugged the 6′ 3″, 300 lb bear out of the woods. My nephew’s grin and enthusiasm matched the size of the bear that he had pin-wheeled…and that was more than enough for me. I had so much anxious energy before the competition; I had a very hard time dealing with it. If I would have had to wait much longer for my heat…I might have blew a gasket! The morning of the competition had my hamstring feeling a little tender and the butterflies in my stomach had me feeling very anxious. 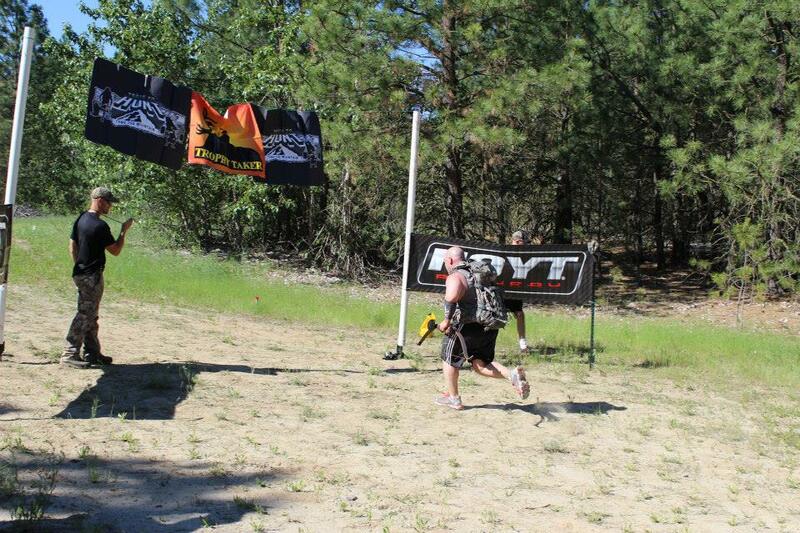 I gave it everything that I had and ended up finishing dead last in my division. Even though the competitive side in me wasn’t happy with my performance that day; deep down a warm feeling of satisfaction welled within me. Sometimes just being able to stay the course and finish; means more than the end result. Crossing the finish line and completing a goal that pushed me past my comfort zone and made me reach deep within myself to complete. A quick note to thank some key people who provided some crucial help that enabled me to compete in this event. I want to first thank Tim Endsley, of Bad Medicine Archery for his endless generosity. Without him, I truly would not have been able to even enter the competition! Also; I would like to thank South cox, of Stalker Stickbows for building the finest, custom recurve that I’ve ever laid hands to. My Wolverine FXT definitely delivers the goods! Last but not least; a huge thanks to my best friend and hunting partner Darin, for running with me and documenting the event. I can’t wait to put all of his footage together! 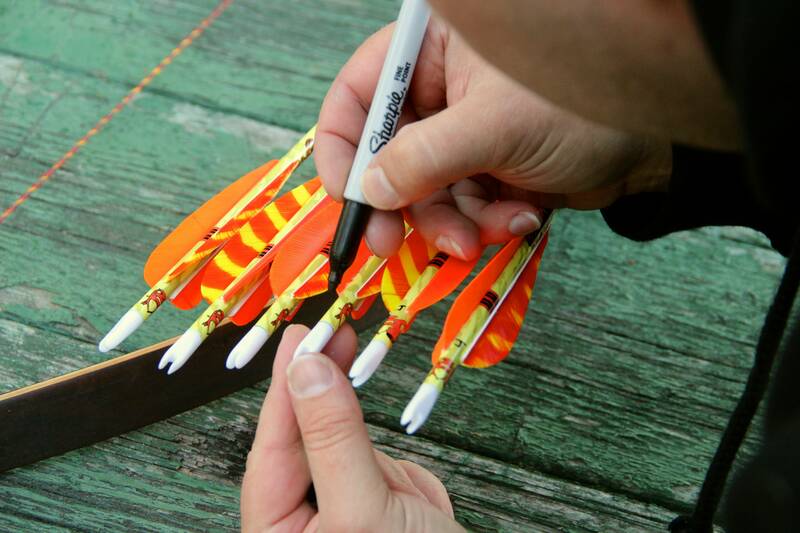 Writing my competitor number on each of my arrows. 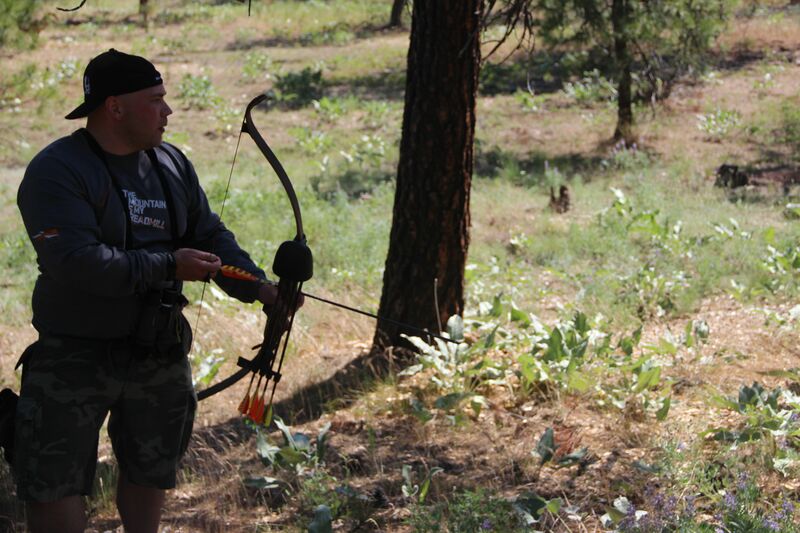 A big thanks to Tim Endsley of Bad Medicine Archery for sponsoring me for this event! 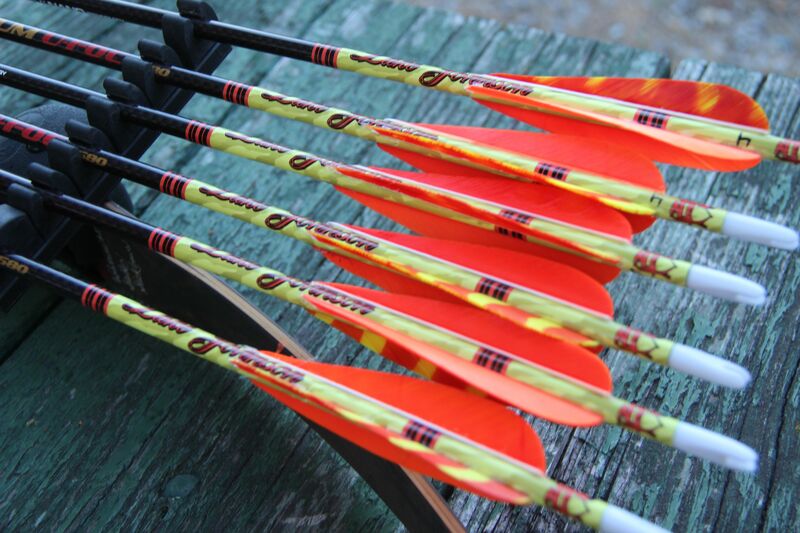 My Grizzly Stik Momentum EFOC’s, dressed up with some blingin’ custom arrow wraps from Bad Medicine Archery. 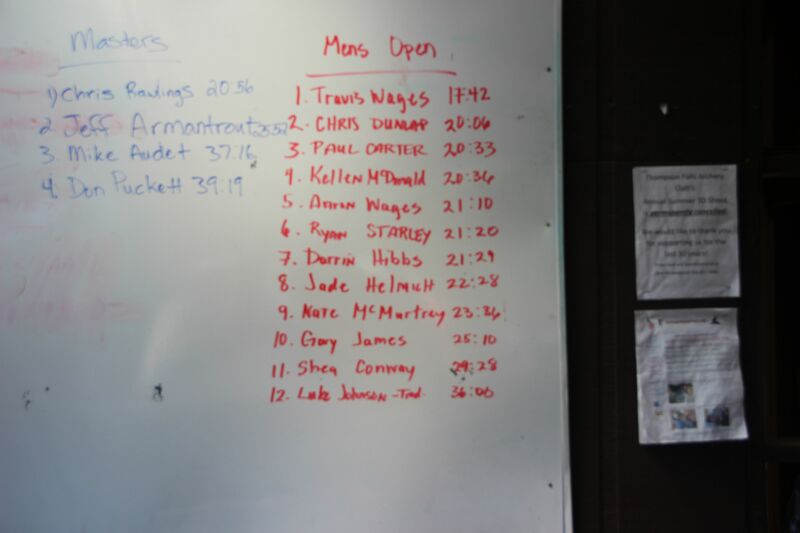 This must have been pee #60 before I competed in my heat. I didn’t have any caffeine that morning…so it must have been nerves. Warming up with some dips. 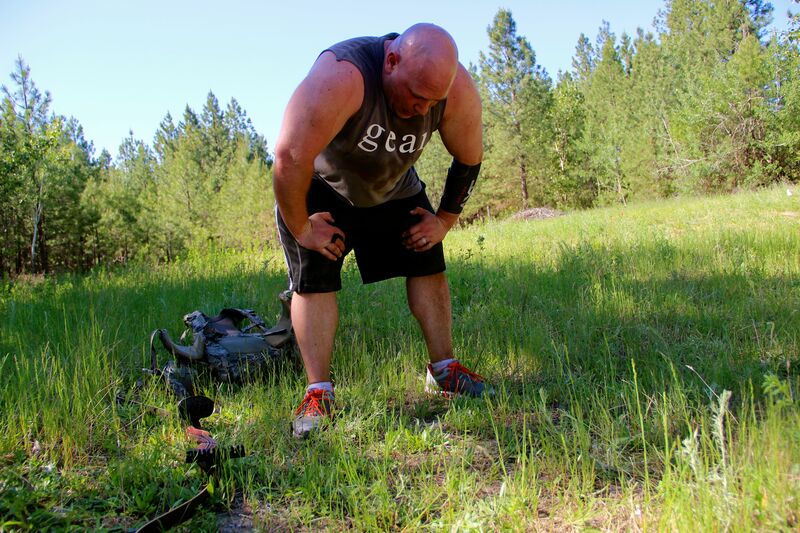 The first physical challenge: over your pack burpees. The one and only target that I missed during the comp; would basically put the nail in the coffin of my placing. If you missed a target; you had to do double of that physical challenge. This was the worst possible target that I could have missed; because Backpack Getups were the only physical challenge that I struggled with. 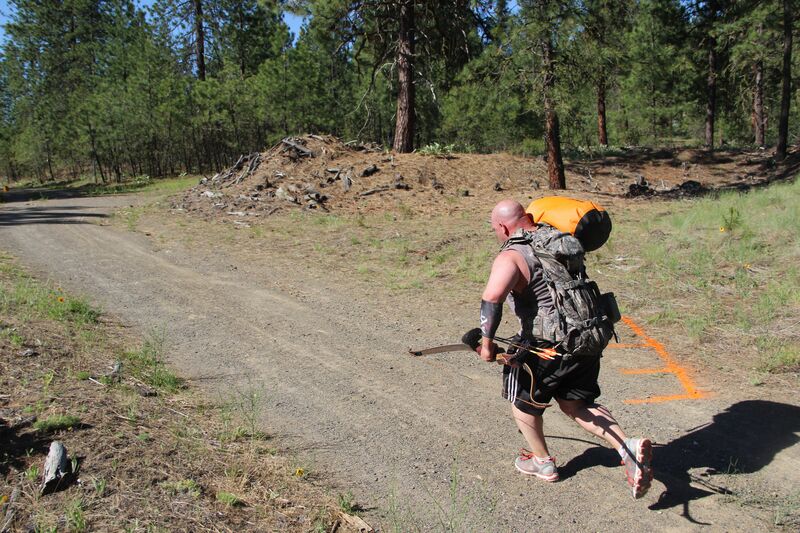 100 yard “shuttle run”, with a 70# sandbag. One of the easier challenges. 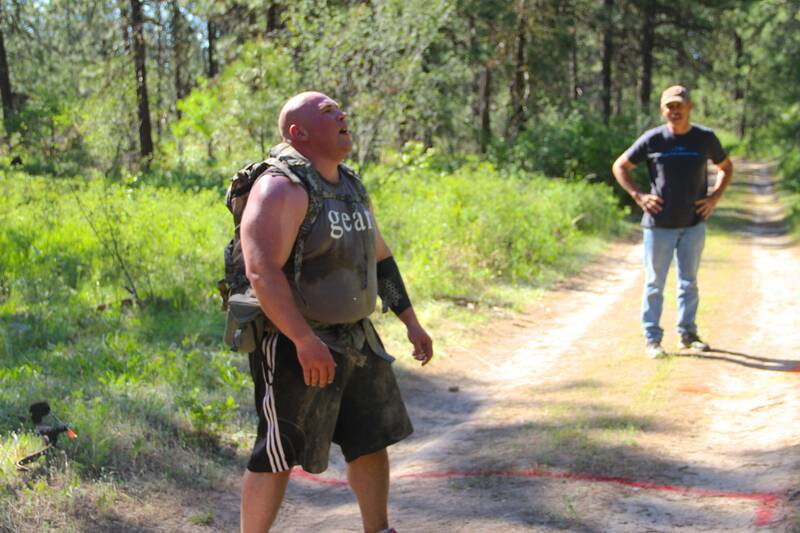 Catching my breath and getting ready to thump a target. 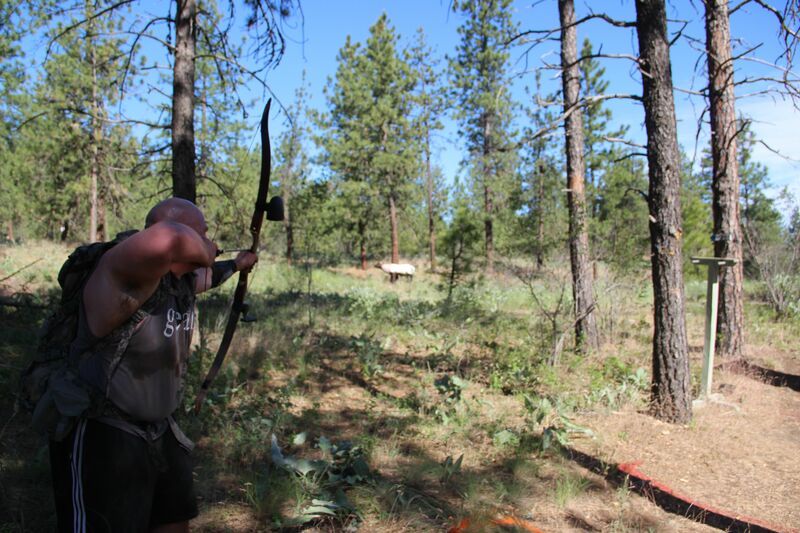 Just after loosing the second to last arrow of the competition. 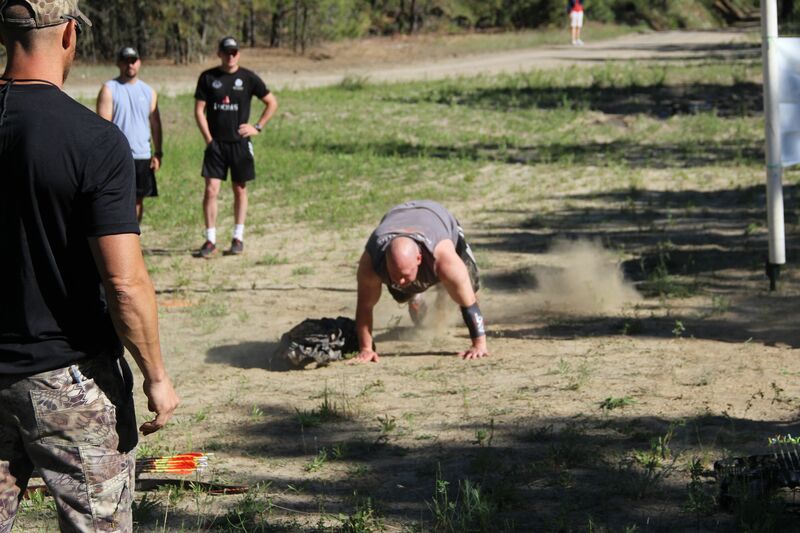 Catching my breath during the last physical challenge: pack on burpees. Heading to the last target. 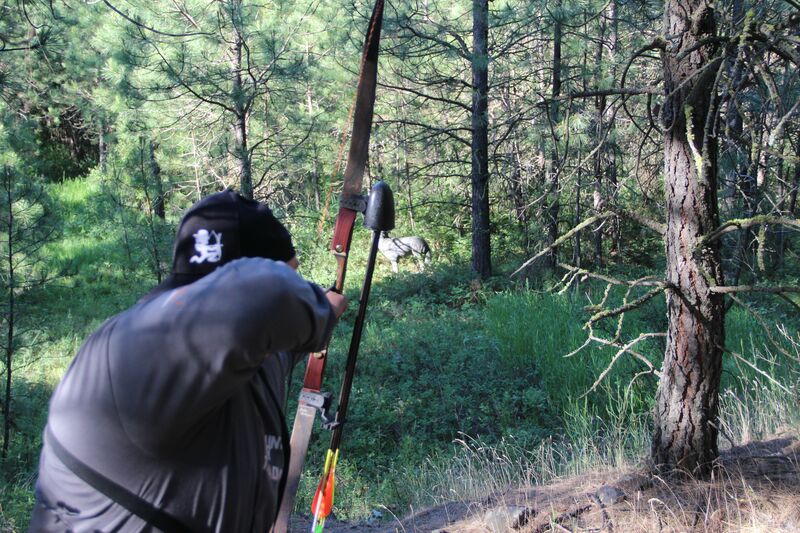 I remember this target vividly; it was an Elk and I was pretty gassed. 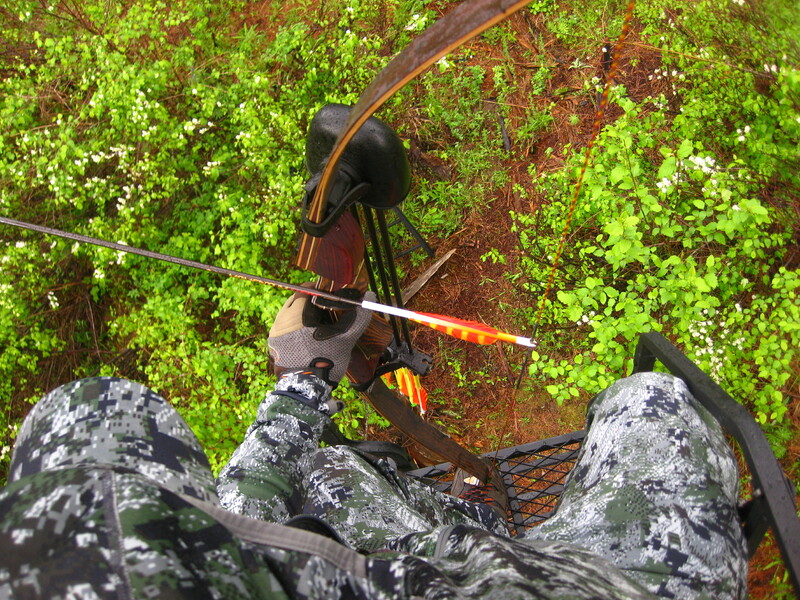 I remember letting the arrow fly…wondering if I had even picked a spot…and then being relieved to see that I had scored a neck hit. Since I wanted to finish strong and not re-injure my hamstring ; I chose to walk at times. This was right before the last target. 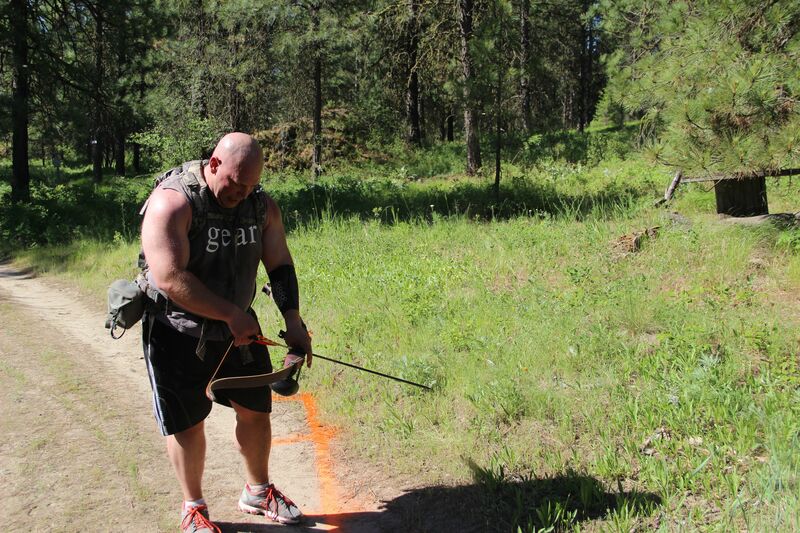 Taking aim on the last target and then it was a 400+ Meter sprint to the finish. 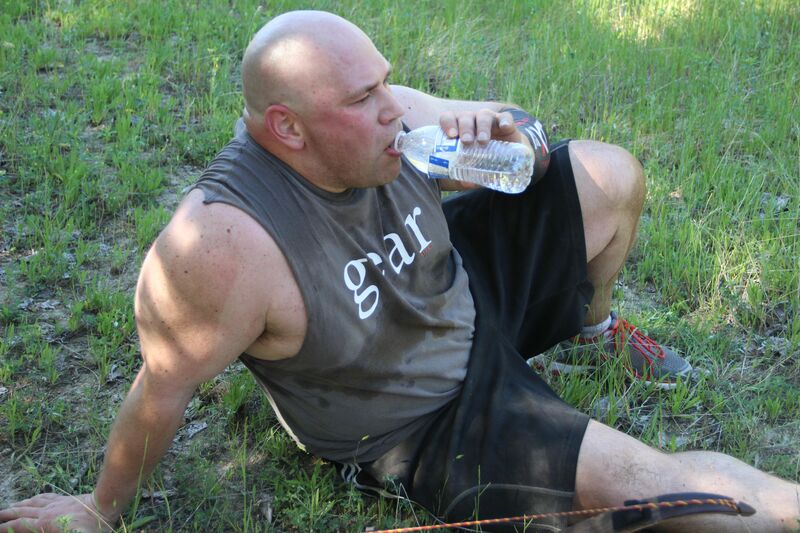 This was immediately after I crossed the finish line. A lot of things were going through my head at this moment. One of which was being glad that my hamstring held up; but the competitor within me was grumbling over my finish time of 36:00. Even though I didn’t finish as competitively as I had originally hoped; I felt deeply satisfied to have finished what I had started. Not the placing I had hoped for! 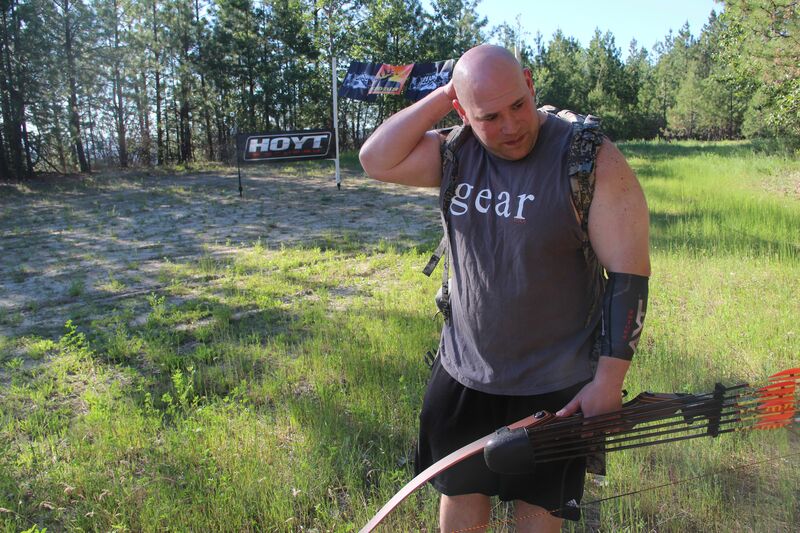 Since I was the very first person to compete with a Traditional bow; I was showed a certain amount of respect…even though I placed dead last. To me; it was just competing with the gear that I would be using when it really mattered. And of course I thought that besides the limitations of my injury; I could have at least made a better showing with my shooting. But I guess that never being satisfied is the only way we can continue to improve ourselves. Warming up before the 3D shoot; which was the second day of the competition. I had the privilege of shooting with a few of the top placers in this competition. Not only were they outstanding athletes; but they were a great bunch of people as well. Thanks guys; I had a great time! 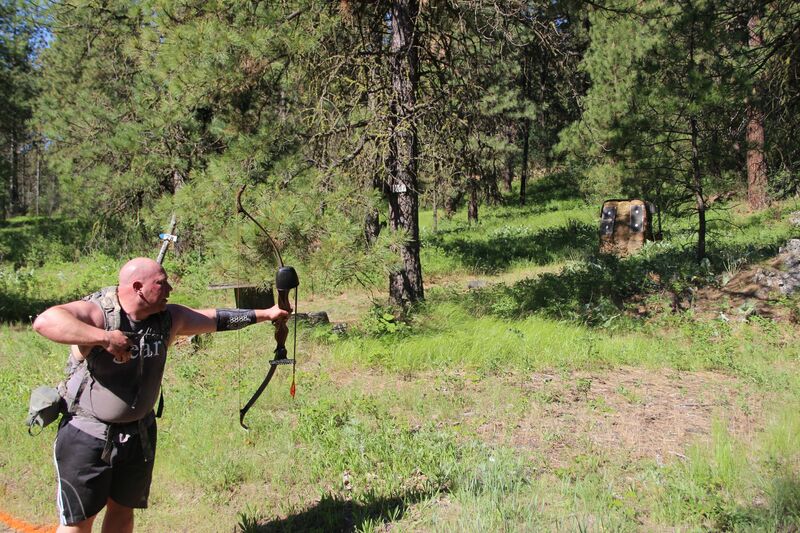 If you look closely; you can see my orange fletching streaking towards the target.